On the top of my list of the most innovative storage items for kid’s bedrooms is the DaVinci 6-Piece Complete Storage Unit Set. If your child needs storage this unit provides it! If you purchase only the set, you’ll get everything from open cubbies to cabinets with hidden shelves to easy gliding drawers. Each cabinet comes with reversible doors that have a chalk board on one side and cork board on the other, so you can mix and match to give your child the hanging or writing space he/she needs to stay organized. Better yet, since each piece is separate you can stack them however they fit best in the space. If this 6 piece set isn’t enough, add on with more of the same. Get additional drawers, cubbies or cabinets to create the exact storage unit your child needs. You can even use separate pieces around the room and in the closet to create a beautiful room decor… DaVinci style. This is a storage set that can start in a baby’s nursery and end up in a college student’s dorm and graduate’s apartment. Or, it can transition into a guest room in later years. Sky’s the limit with this stylish and multifunctional storage unit and separates. 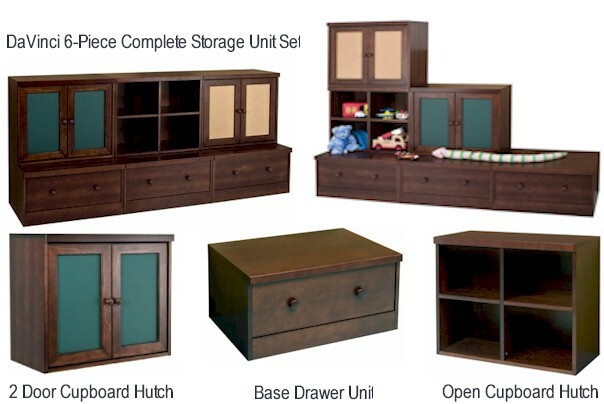 To check out this DaVinci 6-Piece Complete Storage Unit Set and accessories visit SimplyKidsFurniture.com today! Who knew that a simple Media Center could create a miracle in your child’s bedroom or playroom. What’s the miracle you ask? Well, the miracle I’m referring to is a super clean room! That’s almost unheard of when talking about a kid’s space. If you pick smart and get a Media Center with the “works” including: drawers, cabinets and shelves, then your child will have a place for everything and just might put everything in it’s place… hey a parent can dream can’t ya! To get you off to the right start, you might want to check out the Berg Enterprise Entertainment Unit that features lots of storage shelves and drawers, plus display space for a TV. This unit offers you a stylish way to keep all of your child’s CD’s, DVD’s, books and more organized. 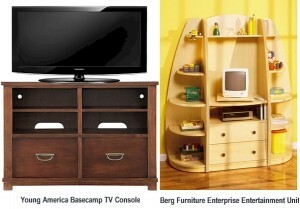 Another lovely option is the Young America Basecamp TV Console that offers the same in a smaller version. Simply place a TV on top and keep media items and more stored below. Heck, why not get both…one for your child’s bedroom and one for the playroom to keep both spaces neat and organized. A media center can offer you a variety of storage options including display shelves, cabinets and drawers, so your child can organize his space the way that works best for him making him more apt to clean-up when guests are coming over. To check out all of our beautiful medial centers stop by SimplyKidsFurniture.com today!